Order your Monteverde Gemstones 10 Bottle Ink Set today from FahrneysPens.com. Fine Pens, Refills & Luxurious Gifts – great prices & fast shipping. For ages, gems have captured the eyes of men and women alike, expressing through their beauty what words cannot. With this in mind, Monteverde created the Gemstone Ink collection: a line of brilliant fountain pen inks that are rich in color and vibrancy. 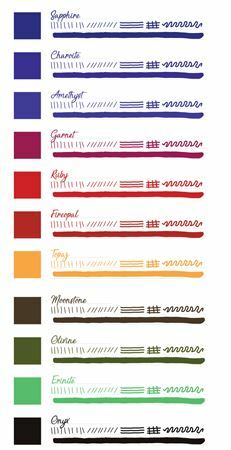 Each color will add a layer of expression and value to your writing. 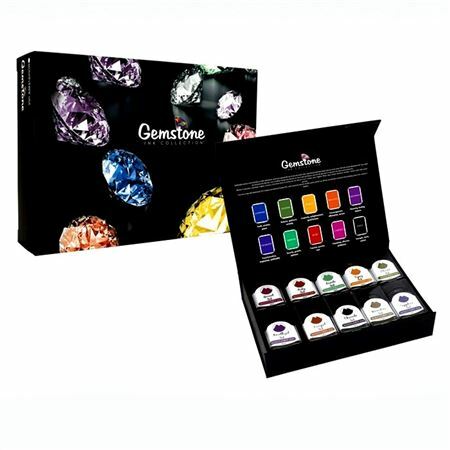 The Gemstone gift box holds ten 30ml bottles of ink in gorgeous colors: Sapphire, Olivine, Topaz, Fire Opal, Amethyst, Charoite, Erinite, Ruby, Garnet, and Onyx. Monteverde ink features a European ink treatment formula (ITF), which improves ink-flow, extends cap-off time, and lubricates and protects the ink feed system from corrosion and clogging. An exciting gift for any fountain pen lover!